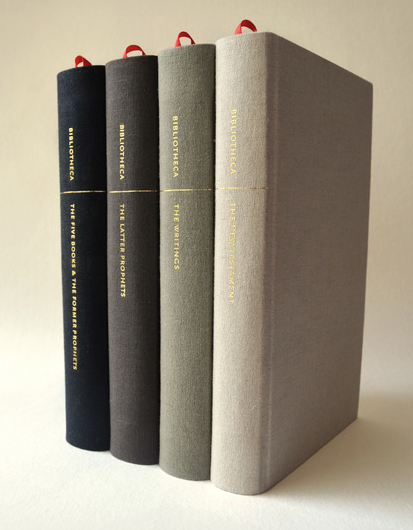 Designed and crafted for reading, separated into four elegant volumes, and free of all numbers and annotations. Speaking of the Bible, last night my cousin sent me a text message, “Check it out…coming to the Bible Collection soon?” He included a link to BIBLIOTHECA, a Kickstarter campaign developed by a book designer named Adam Lewis Greene. I started watching the video and barely two minutes into it I knew I would be contributing to this campaign. Greene has this crazy idea that people might actually read, and enjoy, the Bible if it were stripped from all the things that make it a seemingly insurmountable chore. I agree with him, and guess what, so do 9,626 backers (as of the time of this post). A few weeks ago I finished reading the Holy Bible in its entirety. I have this goal of reading one book a week this year and I was doing just fine until I decided I was going to take on the Bible. Well, it took nearly three weeks, but I did it. And I’m so grateful to have done it. And the truth is I think more and more people will find that reading the Bible not just doable but really interesting as well, once Bibliotheca is produced. And it will be produced, for certain. Greene’s original goal was $37,000 and it is now nearing $1 million, with a day and a half left. You should really check it out for yourself, I don’t want to spoil the fun for you. Regardless of your religious beliefs (or lack thereof), there is no question that the Bible is a book like no other in the history of humankind. Its influence and effect on civilization, culture, art, literature and policy (for better or for worse, mostly worse) is undeniable. What an exciting proposition to think that so many people will be reading the Bible in its entirety, and so many for the very first time. And having just visited the Rare Bible Collection at MOBIA, I am certain Dr. Lupas will be thrilled to add it to her collection. There is indeed a Bible for everybody, as she would say. And Bibliotheca may just be the Bible for a whole new generation.